Santa Claus is perhaps most famous for flying around the world in his reindeer drawn sleigh, as every kid out there knows. But, what they may not realize is that even Santa’s sleigh breaks down from time to time, and when that happens… well, Santa’s got to improvise. If you’re curious as to what that situation would look like, you may want to check out this festively funny Ride A Reindeer Costume for your upcoming holiday celebrations! This silly outfit lets you look just like jolly ol’ Saint Nick does when his sleigh loses a track, or a reindeer runs low on “antler fluid,” or one of the countless other problems that can occur with a mystical mode of transportation powered by a herd of flying forest animals. When that happens, Santa calls up Mrs. Claus to get the sleigh back towed back to the North Pole, grabs his magic bag of toys, and hops on the back of his trusty reindeer Rudolph to finish the job before Christmas morning! And then when it’s all done, Rudolph gets a well earned extra week at the reindeer spa. Okay, we may have made some of that up, but you can’t prove it’s not true. And when you’re wearing this cute and Christmasy costume, you can make up a story of your own! 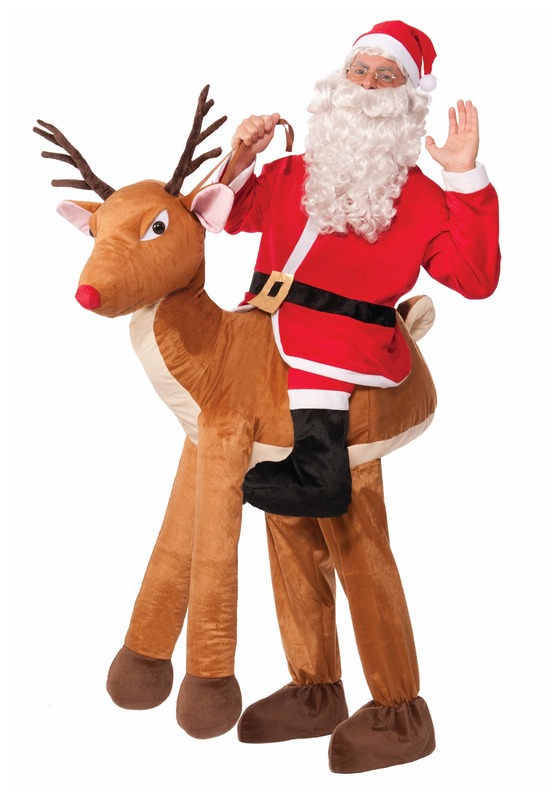 The plush reindeer segment goes around your waist, with your legs making the rear legs and hooves, and the included Santa jacket and cap make up the rest of the outfit. Be sure to add a Santa beard and toy sack to make your story extra believable!